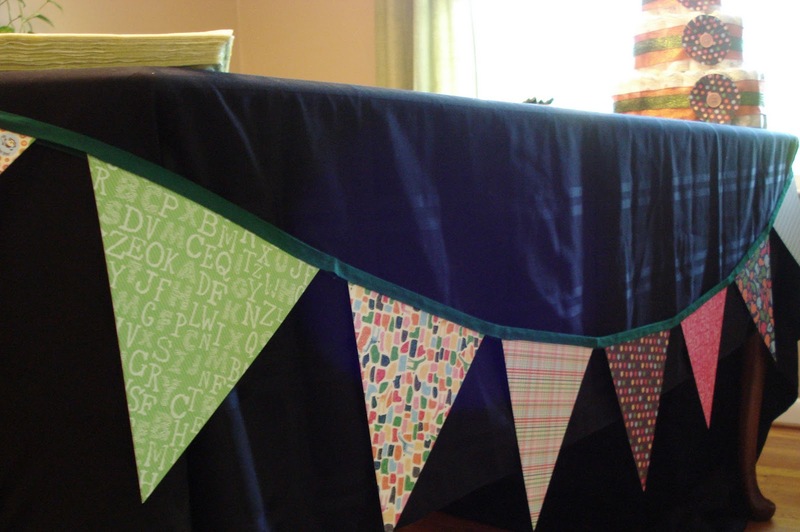 About a year ago I posted a celebration banner I made from oilcloth and recently for my cousin's baby shower I made a very similar celebration banner but out of scrapbook paper. No sewing required! I cut the triangles from a stack of coordinating scrapbook paper and then hot glued them on a long piece of bias tape that you can find at any fabric store. I attached the banner to the table cloth with safety pins and it added a festive bit of fun to the tablecloth I already owned. You could do this for any party you are throwing, it's cheap and easy party decor! Amazing how you can take something so inexpensive and available and enhance a party. Great idea. Hope you are having a great week.